Life throws curve balls and sucker punches causing pain and knocking the breath out of us. If you have known Christ for a short time or for many years, you quickly find out being a Christian does not make you immune to the pain of life. However, a relationship with Christ gives you the power to make it through the pain and bruising left from the curveball, and gives you air when the sucker punch tries to bring you down. I have a few friends who have lost their husbands due to illness in the past two years. Another friend’s husband tragically drowned. Losing the man you thought you would spend the rest of your life with is devastating, to put it mildly. Fear and panic can overtake your mind and emotions with numerous unknowns. How will you make the house payment now? Where will you find health insurance, and how will you put the kids through college? Who can help repair things around the house, and how will you maintain everything by yourself? Maybe you are not dealing with the death of your spouse, but life has you spinning and fear is gripping you from the moment you wake until you go to bed. You lie there hoping for sleep, but worry occupies your mind. We can all agree we have trials and struggles. Some wear us out emotionally and physically, some wipe us out financially, and some do all three. A few weeks ago I read a devotional about giving our fears to Christ. At first, I thought I really didn’t struggle with fear. Then I pondered for a few minutes. I do have fears, but not the kind leaving me unable to function in life or afraid to make a decision. I have many fears. I fear a serious problem in my life will never change. I fear it will take me more than another year to climb out of the debt I hurled on myself ten years ago when I opened a store and had to close it ten months later. I fear I was not a good enough mother to our son. I fear my novel will flop. We all have fears we battle. From the first time I heard the song, Fear Is A Liar by Zach Williams, I remembered the many times I believed the lies of the enemy based out of fear. 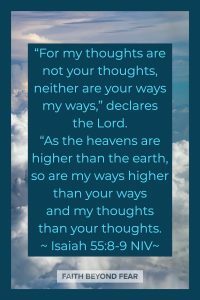 The lie of not being qualified to the calling to write from God. The lie of not being good enough…. good enough wife, mother, daughter, friend, etc. The lie I am not smart enough to run a business. The fear of not being pretty enough… or simply being enough. Listen to Fear Is A Liar. For years, I believed these lies and others. My life changed forever after going through the Bible Study, Jesus, The One & Only by Beth Moore. I had been a Christian since I was a small child, and what I heard in my mind was God wanted a good little girl. If I messed up, God would be mad at me until I asked forgiveness. If I messed up too bad, He would not want anything to do with me. I liked to push the boundaries of how bad is bad. Would He still love me even when I make major mistakes and horrible life decisions? While there is some truth to my little girl thinking, it is skewed. God wants to be in a relationship with me. He wants me to do good because I love Him and I spend time with Him, not for spiritual brownie points. He loves me no matter what. He has given me gifts and talents to use and has great plans for me. When I created an intimate relationship with Jesus, then I saw the world in brilliant colors. I could give grace easily because God gives grace easily. When I live in His power, I able to do things He desires and the world finds them odd and strange. 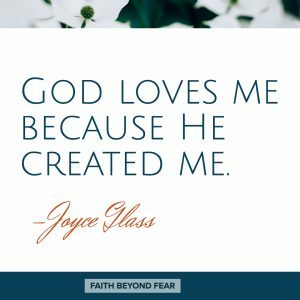 God loves me because He created me. He will love me no matter how much I botch things up, and He wants what is best for me. He will love me, but I still need to come and confess to Him when I messup.. He wants to know my heart and mind keep focused on Him, and not my selfish desires. True repentance is turning away from the sin and never going back. But oh … this can be an extreme challenge sometimes. The flesh has strong desires, and often it takes supernatural strength to change them. Creating an intimate relationship with Jesus is not about how much time you spend reading your Bible, praying, tithing, and attending church functions. Doing these things provides a foundation for your relationship with Him, but they are not true intimacy. Creating an intimate relationship with God includes Him in every part of your day and life. Waking up thanking him for the day and asking for his power and wisdom to guide you. Asking for love to keep you from losing it with your belligerent children. Seeking Him first when you ponder an important decision, big or small. Trusting Him when You don’t know where else to turn. Putting your hope and faith in His plans and knowing His will is best for you and your family. Resting in His promises He will provide all you need. Doing what He calls you to do. Praying when you would rather scream. God did not promise unicorns and rainbows when you decided to follow Him. However, He promised to never leave you nor forsake you. MercyMe’s song, Even If, hits this point home. Because sin is on this earth, we will never be free from pain and hurt until we join Jesus in Heaven. If we didn’t need to rely on God, there would be no point in a relationship with him. If you are married, have children, or even have good friends, don’t you find it refreshing when they come to you for advice, because they know you can help them sort out the problem? They know you are a good listener or can advise them. God desires us to know Him intimately, to rely on Him, and to want to spend time with Him and praise Him. Life is not fair. Just ask Job. He lost everything and was known as one of the most righteous and upright men in his time. Why would God allow this? Only God knows why He felt it necessary to test Job. Maybe it was more for us than Job. We can count on life to have its ups and downs. Things will be unfair and wrong. God asks you to Keep Your Eyes On Me (Faith Hill & Tim McGraw). No matter what, we are to keep our focus on Him. If we are doing what He asks us to do, He will carry us through every situation. Listen to Keep Your Eyes On Me. Sometimes we can’t see Him or feel Him in the dark night of our lives, but He is there orchestrating things we will never see. In the sea of uncertainty, there are always some things we know we can do. We can pray, and trust Him. We can do our job to the best of our abilities despite the pain or fear we are dealing with. We can love our family even when they may be unlovable. We can trust God with the details and ask Him to show us the next step. Believe me, I know this is much easier said than done. God never asked us to bottle up our feelings. He is big enough to deal with our freak-out moments, panic attacks, and unimaginable fear. True intimacy is all about being able to share the highs and our deepest lows. He does not expect us to be perfect, but He expects us to seek Him and trust Him through it all. Anxiety, depression, and fear may be friends you live with, and you’ve become accustomed to them hanging around. This does not make you a bad Christian, nor a messed up one. It makes you human. Seeking the help of professionals and medicine may be necessary. God wired us all differently. All He asks is you do your part to stay in relationship with Him, and He will do His part to fill you with His power, peace, and love to live your life. He will guide your steps to healing, and there are different levels of healing for each of us. Healing, for others, may mean you only need medicine for a short time. Neither one is better than the other. What God desires most is to be in intimate relationship with you every day, and you taking care of your body to the best of your ability. Keep Your Eyes On Him Even If Fear Is A Liar to you. Listen to each of the songs, and pray about whatever comes bubbling up in your heart. Journal your prayer to God. Share with Him your fear, shame, hurt, pain, and disappointments. 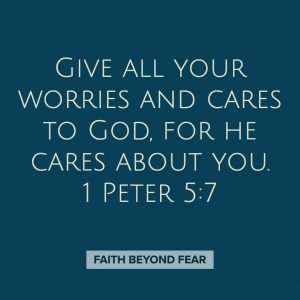 “Give all your worries … to God, for He CARES about YOU!” Do this as often as you need to, and He will bring you peace for the journey. 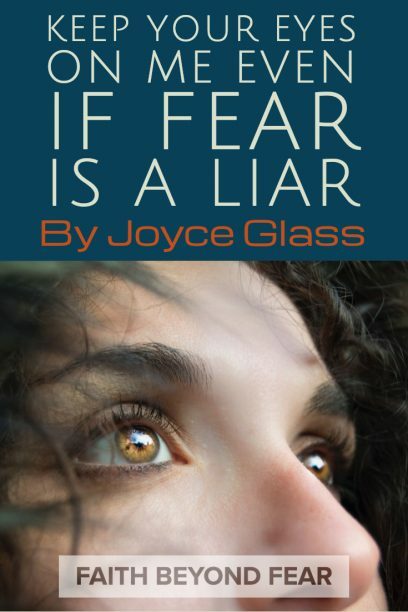 Joyce Glass is a writer, speaker, writing coach and lover of most things chocolate! Her desire is to encourage you to write your book and share your expertise with the world. 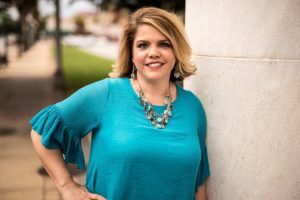 She loves to teach the power of story in nonfiction, and has a passion to see you connect with your clients and customers. She has self-published two books while helping others create their nonfiction book. Weekly she shares writing tips on her podcast The Write Hour ~ Nonfiction Tips From The Write Coach. The best part of being a writing coach is watching her clients create their own masterpiece, and seeing their joy when they share it with the world.